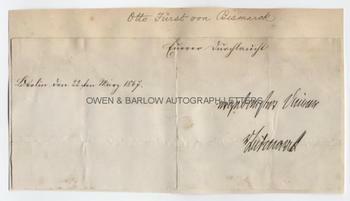 OTTO von BISMARCK Autograph Signature. Prussian statesman who unified the German states and became the first chancellor of a United Germany. Two words in his hand and signature taken from the foot of a document. Dated in a clerical hand Berlin, 22nd January 1867. Paper piece backed onto part of an old album leaf. Measures approx. 4 x 9 inches (excluding album page mount). In good condition. Provenance: From a 19th century album compiled by the Blyth family. The family appear to have been connected with the engineer, Benjamin Blyth and the thrice premier of Australia, Arthur Blyth.